I’ve added a few more scarves to my Etsy shop! Have you read “Anne of Windy Poplars” in the Anne of Green Gables series? As a teacher in a town far away, she describes eating pumpkin preserves as getting to eat sunbeams trapped in a jar (until she gets totally sick of them!! ), and that is what your scarf reminds me of. It’s impossible to get sick of a scarf! The scarves are magnificent! I want one so badly, but I have to wait awhile. Sigh. . . .Stupid economy!!!! Those shades of yellow together are to die for! I have a pashmina with all those shades in it and it seems to look good all year around. The lucky someday owner of that one will get a lot of wear out of it I bet! Hope things go well tomorrow for Franklin and the Yarn Harlot at Lettuce Knit. Enjoy all the fun! Ok, I couldn’t wait on the dress details. I checked out your Flickr.. awesome dress! Did you get another hair cut? Your hair looks great. Now I can’t wait for the sewing details! 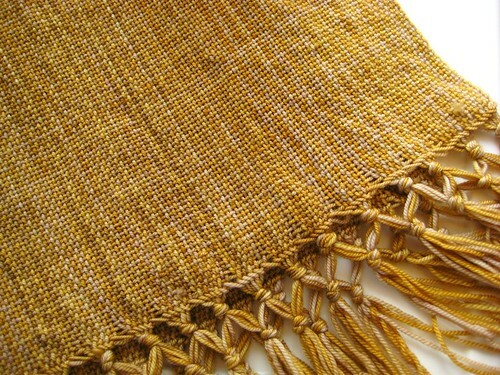 So I’m thinking about learning to weave and getting myself a loom (or borrowing one until I am sure). Can you recommend any good resources or a good beginner loom?